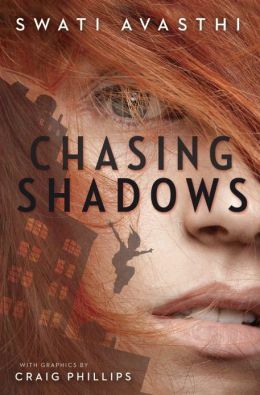 This week's Book Giveaway title is Swati Avasthi's novel Chasing Shadows. Featuring graphic novel-style illustrations by Craig Phillips, this book uses elements of Hindu myth to "create a gripping portrait of two girls teetering on the edge of grief and insanity." Admittedly, gripping portraits of grief and insanity are usually something I do my best to avoid, but the reviews for this sucker glow like a 100-watt bulb, so I've decided to give it a shot. Our review will go up this afternoon. NOTE: We think we've fixed the problems with the email page, but if your message is marked un-deliverable, you can send us an email directly using the address "info [at symbol] wordcandy [dot] net" (minus all those spaces, of course). Sorry for the ongoing confusion!